and soon to be published Shunned. He has written over a dozen articles on Original history and lore for the National Indigenous Times, with four articles in New Dawn. With close to 30 years of contact with Gumilaroi people and tribes of the Bundjalung Language Confederation, and the benefit of extensive consultation with many Elders, the history revealed is part of an Original narrative that was almost lost. Ancient Egyptian Hieroglyphs discovered outside Sydney Australia. The Kariong Glyphs site is the most argued over and controversial archaeological site in Australia. Decried as utterly bogus by authorities and skeptics, it is an archaeological ‘poison chalice.’ My colleagues and I have been denounced as “dumb and dumber,” “liars,” motivated by “money” while working in an “unscientific” manner driven by an unstated “agenda,” simply because we find fault in every explanation of a hoax and merit in the notion that some of hieroglyphs were carved by ancient Egyptians. Found in the Central Coast of NSW, there are two sandstone walls at a site that is still extremely difficult to locate. These walls have close to 300 engravings. Some claim they are a random mixture of ancient scripts done recently, others believe they are a genuine example of the earliest style of Egyptian writing (Proto-Egyptian). There are so many rumors and stories accounting for their presence, too many to canvas now, but there are a couple of explanations that seem to be the most convenient, and have become the “accepted versions”. Without doubt the two most popular offerings relate to them merely being the scratchings of a “deranged Yugoslav” concocted in the late 70’s, or the actions and chisels of mischievous archaeology students from Sydney University in the early 80’s. According to National Parks and Wildlife Service, the engravings were created no earlier than 1983. Such was the passionate and widespread conviction that the site is a hoax, my colleagues and I could never commit ourselves fully to believe it was a genuine ancient Egyptian artifact. On previous visits to the walls we had devoted less than five minutes to actually examining the hieroglyphs; it was far safer to focus on all the archaeology with Egyptian undertones surrounding the site and let others argue over who and when. That was before. Once we began filming an interview with the two Original spokespeople for the site (Egyptians in Australia-Part 2 - far below video), everything changed. Until that day we had listed the Kariong Glyphs as ‘number 52′ in our collection of 60 odd pieces of evidence substantiating an ancient Egyptian presence in Australia. After speaking to Aunty Beve and David Fitzgerald, the glyphs have been repositioned at ‘number 1′ with daylight running a distant second. Aunty Beve is one of the last Darkinjung Elders. She is the keeper of the women’s stories and one of the very few who has the right to speak on Original Lore and Dreaming stories in this tribal region. Her word on such matters can not be challenged. Up until now, whenever asked about an Egyptian involvement in creating the hieroglyphs in the area, Aunty Beve always refused to make any public statement. This time she broke her silence. She also explained why many of the carvings look incredibly fresh and well tended, and certainly don’t exhibit thousands of years’ wear and tear or build up of rock varnish, as one would expect;- In ancient times the women would use their urine to clean the engravings on a regular basis. Aunty Beve went even further in noting there are other carved hieroglyphs in the region (of which we are aware of two) that are “far older” and are “not Egyptian,” but were created by Australians! Could this mean the Egyptians learnt the art of writing with hieroglyphs whilst in Australia while under Original tutelage? While the concept of ‘writing beginning in Australia’ may seem somewhat radical, it isn’t. 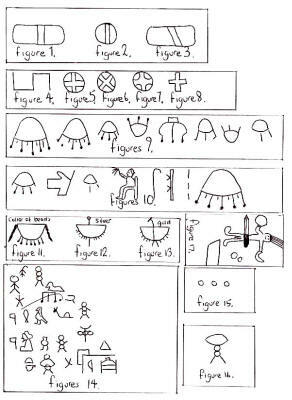 Respected academics including Lesley Maynard and Robert Bednarik have stated that the engraved symbols found at Panaramitee (SA) may be the initial inspiration behind all forms of written communication. Bednarik conducted a ‘straw poll’ to test the likelihood that Original people “invented” the first alphabet/codified set of symbols. Bednarik was convinced that some of the art of other continents resembled the Panaramitee. He sent out copies of seven unlabelled drawings of engravings (mainly circles and arrow-like marks resembling bird tracks) and asked eight rock art specialists to identify whether they were Panaramitee style or not. With the benefit of hindsight and Aunty Beve’s guidance, it is now obvious Bednariks’ second option of “a world wide trend” was indeed the answer he sought. Aunty Beve provided an historical Black-fella perspective in the interview while David completed the picture by providing a White-fella update, replete with “cloak and dagger” business. David Fitzgerald was a “building contractor and unofficial sites finder” for National Parks and Wildlife Services (NPWS) Brisbane Waters, and is a blood descendant of the mighty warrior Pemulwuy. 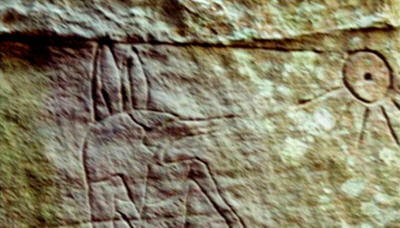 He first became aware of the site in 1978, at least 5 years before NPWS claim they first knew of the hieroglyphs. David was very open in acknowledging there was a deliberate cover-up, and that it took some haggling by him (and even a degree of “bribery”) before they showed him the two walls in 1978. He was taken on dusk and made to promise he would never speak of it to others. What he first saw was a huge accumulation of natural debris wedged between the two walls with only the top levels of hieroglyphs visible. The rest was submerged under tonnes of litter. This advanced state of disrepair casts serious doubt upon the most popular version of the supposed skullduggery that led to this hoax being created. The story goes no more three years before this massive clean-up occurred. Alan Dash, a surveyor working for Gosford Council, found a ‘deranged Yugoslav’ exiting the two walls with chisel in hand and assumed he was responsible for the exotic graffiti. Dash then walked in and examined the walls freely with barely a twig beneath his feet. Outside the incredibly remote possibility that tonnes upon tonnes of debris accumulated on this site in less than a thousand days, one of these accounts is plainly wrong. With the Dash version virtually dismissed, I raised with David the possibility that Sydney University students were responsible. Of course, since this is claimed to have occurred in 1983 and David saw the two walls slowly reveal their narratives five years earlier, such a scenario was already not feasible. But as is often the case, many lies have their genesis in a truth, no matter how convoluted. Yes, the date was 1983. And yes, students from Sydney University were on site and standing between the walls. David should know - he took them there! But the notion that these same students then engraved the entire gallery had, at least, a small fingernail of truth within; one of the students began scratching at the a glyph with her fingernail, David was far from impressed and made it clear she stop immediately. Soon after he escorted them from the site. I asked David if, during these early stages, anyone from NPWS objected or claimed it was just a clever hoax. In researching Original history and lore, my colleagues and I take our cues from the region’s Elders and custodians. Aunty Beve and David’s testimony is the final word - some of the glyphs on the Central Coast of NSW are Egyptian. Whatever the unnamed ‘deranged Yugoslav’ chiseled, Alan Dash saw, or devious students engraved is just the White-fella’s take on history… a sorry story that has been blindly accepted for centuries. Our brief is simple; report as given (not amended or sanitized) the information shared with us by the Original custodians of lore and culture. After all, they were here when it happened. For my colleagues and I, the final word on this debate belongs to the first recorded reference of the Kariong/Egyptian accord. Misfortune befell them and one was “bitten by a snake,” died and was “buried“ near the walls. Three Original keepers of lore stand united in testimony, and from our point of view all questions of authenticity are no longer an issue. There are Egyptian hands at work, that is definite, and equally there is evidence of their presence everywhere around this site, and many other places. We suspect there are at least two narratives on these walls, and that the more recent account details the arrival and tragedies associated with two sons of a Pharaoh. The scribe for Nefer-Djeseb and Nefer-Ti-Ru made note of being “stranded in this wretched land” and that their chances of returning were negligible. They experienced “drought”, and for reasons unstated Nefer-Ti-Ru made his way “westward” for “two seasons.” Unfortunately, while returning, he was “bitten” not once but “twice” by a “snake”, died, and was buried near the two walls. At the most simplistic level, those three sentences paraphrase the Egyptian narrative as supplied by Ray Johnson. He was the first to understand why previous academics dismissed the symbols as a haphazard mixture of ancient scripts; none were familiar with the most ancient form of Egyptian hieroglyph:- Proto-Egyptian. Johnson went to Egypt and presented his research to the Director General of the Cairo Museum, Dr. Abu Dhia Ghazi, who confirmed his interpretation was correct. But that is nowhere near the end of this significant emerging truth. We are convinced the younger set of engravings is possibly 4,770 years old, but the older narrative could date back much, much further. When my colleagues and I ask for guidance on how far back and from where the inspiration came, the response is always the same; every tribal group we have met or know of carries one constant, one Dreaming story that transcends boundaries: the Seven Sisters, Pleiades. On those walls, we suspect this same story, celestial place and direct genetic involvement is recorded in stone. For now enough of Kariong. I could discuss it in more detail, but the engravings are too detailed and need 3000 words for the briefest coverage. In the November/December edition of New Dawn we go into more detail and separate the two accounts, one of earthy origin and one from the stars. Our aim here was to establish the authenticity of the site, and because of this truth these two sandstone walls and associated archaeology rewrite Australian and world history, pose questions about why the Egyptians came here, and challenge fundamental assumptions made about the role the Australian Original people had in global pre-historic times and genetics. Long before the Egyptians sailed to Australia, or any race for that matter, people from this continent sailed to other continents all over the world. Mummification, as with earlier examples we have presented, is assumed to be something uniquely Egyptian. It isn’t. Mummification is a common Original funerary ceremony and occurs at a variety of places throughout Australia. One mummified corpse, along with a canoe used in these rituals, was stolen from Darnley Island (Torres Strait) in 1875 by members of the Shervert expedition. What needs to be understood is that the Original influence in Egypt is not just related to higher realms of the esoteric, limited to a select few, but had spread throughout the landscape. In the eyes of most Australians, where there are gum leaves so too koalas, kangaroos and sundry native species. In what is possibly the most famous example of a long-standing Australo-Egyptian formal liaison, the discovery in King Tut’s tomb of a dozen wooden boomerangs, each of a unique design and typical Original patterning, should have caused a huge unrest within Australian academic circles. Instead it was met with a deafening silence. My colleagues and I were recently contacted by 3 separate sources over 3 consecutive days, and in each case (bar one specific narrowing of focus) the news was as identical as it was amazing; the gold used in Tut’s tomb was carrying an Australian ‘signature’. We have since tried to chase up the credentials of this claim. As things stand it is a work in progress. None of this can be found in text books or school curriculum in any part of Australia. What makes me sad is that this glaring omission from Australia’s history does not stand alone; it is merely one chapter among many. Equally, it needs to be acknowledged that the Egyptians were but one of many nations that made contact with the First Australians. ...all walked on these shores well before Cook. And all, bar the British, stayed for a period of time and left when asked. So much has been lost and stolen since the invasion, but in the spirit of Wirritjin (Black-fella White-fella Dreaming) the Original keepers of lore are revealing secrets never before shared, of a past and a heritage that was never forgotten - just hidden until the time is right. ‘Australia’s unwritten history’, Walkabout, August 1967, pp. 19-23. Robin Stummer, 23rd Mar. 1997,”Brit brains solve the Riddle of the ‘rang- Robin Stummer on the Scientist putting the boom in boomerangs”, The Independent. 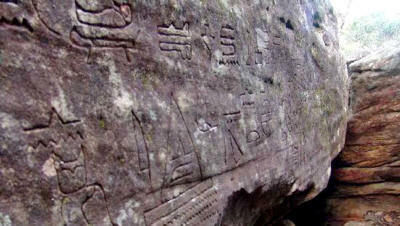 In my previous article on this topic, my primary focus was to evaluate the credentials of some of the most popular hoax theories used to discredit the authenticity of ancient hieroglyphic engravings found on two sandstone walls near Kariong NSW, and establish the truth of an ancient Egyptian involvement with the Original people of the area. But there is still one hurdle to overcome; when read in combination, the hieroglyphs don’t seem to make sense to today’s experts. Some of the glyphs aren’t recognizable, and others are not depicted exactly as they should be. Undeniably many characters are Proto-Egyptian, while quite a few are not. But the real problem here is not on the wall but within its observers. The critics are limited by their ethno-centric blinkers, and could never reverse their perceptual parameters to consider the possibility that some of these engravings were actually carved by Original hands. But what if this is not an exotic copy or transcription but an example of the ancient style and script used by the Original people? With Aunty Beve adamant the older hieroglyphs were not Egyptian but Australian, and distinguished linguist Atilla Flinck absolutely convinced the Australian Root Language is the foundation base and geographic origin from which all other languages evolved, it starts to become obvious why the Egyptians (and others) sailed to this distant southern continent so long ago. They came to Australia as apprentices, seeking spiritual wisdom, to be educated by the people who spoke and wrote the first word. The historical truth known by ancient Egyptians, and others, was that this place and the nomads who inhabited it provided the inspiration for all the varying accounts of the ‘Garden of Eden’. 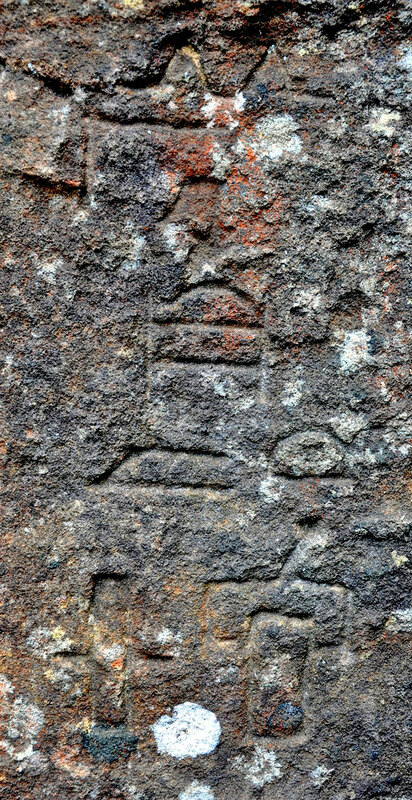 There is one section of the wall’s carvings that is distinctly Proto-Egyptian, and there are many other glyphs that are identical matches to known script. This consistency is augmented by a variety of iconic symbols (pyramids, the Sphinx, Suti, an Ankh, etc.) 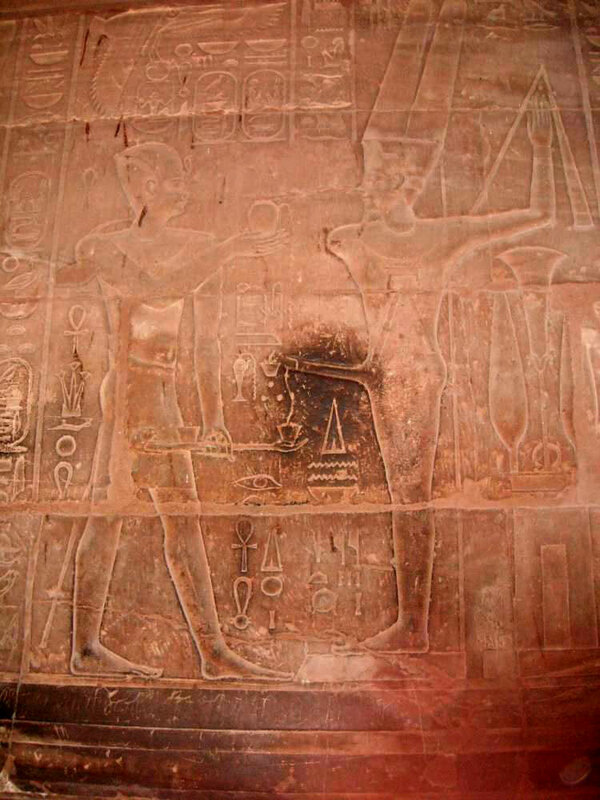 appearing on the walls, and the Original peoples’ testimonies of an Egyptian presence - on site with chisel in hand. But there exists a more authoritative source from which to base any interpretation of the Kariong Glyphs, and one which all our translations and assumptions are based; Ray Johnson’s book Basic Hieroglyphica. 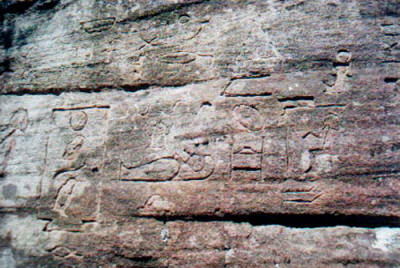 Johnson re-sparked the debate and controversy surrounding the Kariong glyphs when he provided his interpretation of these carvings; he believes that the script is the earliest form of Proto-Egyptian hieroglyph. More importantly, once he realised the massive implications of this analysis, Johnson had the foresight to make direct contact with the Director General of the Cairo Museum, Dr. Abu Dhia Ghazi. After reviewing Johnson’s interpretations, Dr. Ghazi was more than satisfied that Johnson was correct, and his endorsement (along with his immense wisdom and integrity) indicates that Basic Hieroglyphica is the best of all publications from which to begin our attempt to fathom the ‘who, when and what’. Much has been made of the apparent differences displayed on the Kariong walls; critics claim there are two distinct accounts depicted, as some engravings are the result of a much more delicate and skilful hand than others. After considerable comparison and consideration, my colleagues and I are inclined to agree with the doubters. But where we part company relates to timing. Some of the engravings look unworn and ‘recent’, and skeptics therefore see this assortment of relics, shafts and hieroglyphs as bogus. But the interviews we held with Darkinjung Elder Aunty Beve Spiers and Mr. David Fitzgerald (formerly of National Parks and Wildlife Services) amply explain why the carvings look so new; they shared knowledge of a recently-fallen rock roof which for centuries protected all the writings and provided close to a complete seal from the elements. They also described how the liberal application of Original women’s urine to the glyphs was used to aid their preservation. Our understanding is that the roof, which is now the floor and very hollow-sounding when walked upon, collapsed no more than 40 years ago. This would also account for why the more exposed wall appears to be the most worn; this erosion and wearing of the glyphs only began once the roof gave way. We believe some of the writings, perhaps less than a third, are Proto-Egyptian and are most likely around 4500 - 4700 years old. That part is easy. But spread throughout the walls, with Ray’s manual as our guide, my colleagues and I found a pattern emerge that set us off on a tangent - one we had deliberately kept at arm’s length until now. The glyphs depict 4 cartouches, which are oval symbols with a horizontal line at one end, used in hieroglyphs to indicate that the text enclosed within the oval refers to a royal name. Of the four cartouches, only one is correctly aligned, and three are reversed. And we noted that, around that one cartouche, over 90% of the symbols are readily recognizable and a comfortable match to glyphs Ray provided. The narrative - which names Nefer Djes-eb, his brother and their Egyptian lineage, and the snake encounter and encryption - is undoubtedly Proto-Egyptian, and we believe was written by Nefer Djes-eb’s scribe. But when we separate from the overall mix the carvings clustered around the tale of the two brothers, barely 50% of the remaining engravings are a comfortable match, and close to one third show nothing that is remotely similar. And it is that unknown category that creates the greatest difficulties… and possibilities. Both Ray Johnson and Dr. Hans Dieter von Senff, who based his work on Ray’s translation, acknowledge there were many symbols that had no obvious match. With some symbols, educated guesses and assumptions were made. The number is not small; it is in the dozens. And that fact alone presents a major obstacle when defining their content. Many glyphs have a variety of meanings, and the positioning of associated glyphs makes all the difference, even more so when the reader is unable to determine any meaning. What only adds to the possibilities was Aunty Beve’s revelation that some of the glyphs were carved by Egyptians, and that even more ancient glyphs in this area are not Egyptian, but Australian. Could it be that Proto-Egyptian hieroglyphs evolved from the much more ancient local script, and that once this form of script left Australian shores the many differences and omissions emerged - reflecting the differences in culture and lifestyle? This would explain why there are two accounts and hands at work on these walls, and what motivated Egyptians (and others) to sail to these shores in ancient times. My colleagues and I suspect an ancient Australian genesis is evident in the languages of all races, as proposed by linguist Attila Flink; a theory that is supported by some information we recently received from a Wake Up World reader, Mr. Christopher Basille. We are extremely thankful he took the time to contact us, as the comparison he supplied illustrates the antiquity of the Australo-Egyptian accord, and the initiator. I remember noting that the ‘Djamu’ appeared in two other seeming unrelated places. Discounting the more recent correctly aligned cartouche and associated glyphs, it is our opinion that most, if not all, of the remaining 250 odd hieroglyphs are far more ancient. We have found repeated references to a more ancient civilization, and in both cases the older script is used. Even though Ray Johnson’s Proto-Egyptian is derivative of the more ancient style which may well be Australian, it still provides links and potential clues. Such is the case with Figure 1 (shown below), which seems a fairly non-descript icon that has no identical match. The problem is that “land’s end” [vii] is a indeed a four armed cross but it was never enclosed with a circle. The circle was deliberately placed to seal the glyph on the wall, and as such, should not be assumed to define “land’s end.” [viii] However, there are three other candidates and each has a four-armed cross, one with a circle and four armed cross slightly off-centre (Figure 6 below), another is almost the same as that on the wall but the arms of the cross are slightly curved (Figure 7 below) and the other is exactly the same as “land’s end” (Figure 8 below). Now we come to the most controversial aspect and most repeated glyph icon on display. 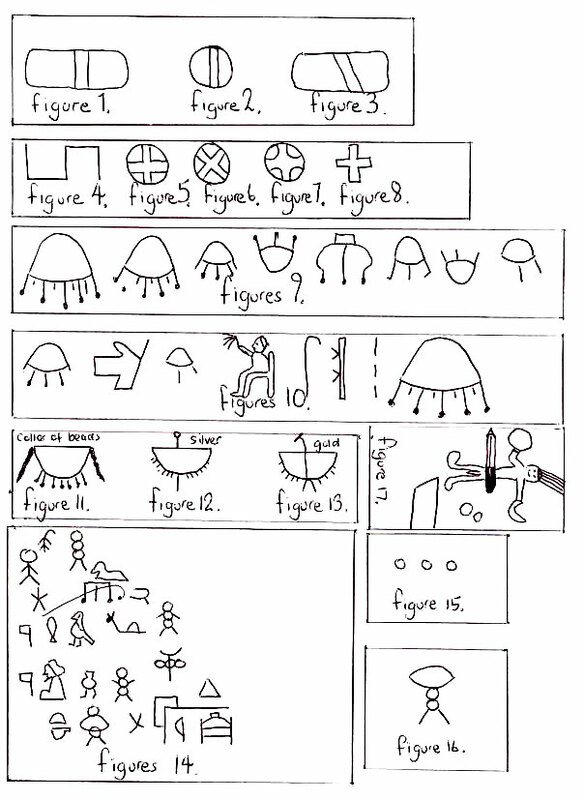 There are, depending on perspective and ‘blinkers’, up to 8 glyphs (Figures 9 below) that fall into the ‘UFO’ category. This label is not our term, but is the common label used by the general public, and describes a series of engravings which have been lambasted by doubters and used as evidence that the entire gallery is bogus. The ‘UFO’ icons have nine legs, seven, five and three legs, and all are of differing shapes and sizes. The deliberate variation in features is in contradiction with any standard ‘jewellery’ text, which demands uniformity. Every other repeated hieroglyph maintains the same form and size, and in this respect, these glyphs stand apart. 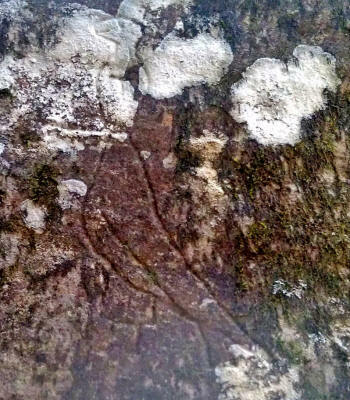 Of the ‘UFO’ glyphs, the most remarkable is a line of eight symbols (Figures 10 below) which my colleagues and I suspect to be the most important statement of intent and origin found on the two Kariong walls. We have seen other interpretations of this line, but all omitted the first four symbols. The deletion of two UFO glyphs, thus leaving one inconvenient inter-stellar craft to negotiate, is a crucial error in interpretation. However no Egyptian scribe was allowed such poetic license, and to claim that these objects are actually pieces of jewellery is manifestly false. All jewellery glyphs (Figures 11-13 below) have a lower case semi-circle sealed off with a straight line, while all UFO glyphs have an upper case semi-circle/ellipse with no straight line. The positioning, size and number of arms are markedly different, and the reality is that there is much more separating than connecting the two symbols. My colleagues and I believe these holy extra-terrestrials came from Pleiades. We agree on this distant location simply because, in Australia, there are quite literally no other candidates on offer. Aboriginal ‘Dreaming’ stories told throughout the country constantly refer to Pleiades (the Seven Sisters) as do many Elders and Keepers of Lore. Time after time, Pleiades has been nominated as the location from which their ancestors originated. As such, it is possible their Pleiadean ancestors may have actually been involved in the genetic development of one species of hominid: Homo Sapiens. The opening set of hieroglyphs on the walls (Figures 14 below) is basically undecipherable, and most symbols do not appear in Ray Johnson’s manual. At the beginning is a front-on stick man. But all human bodies in Proto-Egyptian script contain, at the very least, a defined torso and are in profile. Just above and to the right are three stacked circles with two legs. Granted they are aligned horizontally and spaced apart, but there is nothing else remotely similar. Could it be the object or being depicted here has been created through some sort of chemical or genetic process? In what only adds to the possibilities, just below are two other three circled figures and both of these have also been given arms. Close by is yet another sequence of three circles, and on this occasion they are in the proper horizontal alignment but are bisected by a staff/sceptre. Is it possible this actually describes the manipulation of the hominid gene? Around this cluster of unknown glyphs, a few conventional Proto-Egyptian hieroglyphs can be identified. This certainty seems to add weight to the interpretation that the glyphs represent genetic manipulation by those far more advanced. The two icons appearing like small flags denote “God,” [xv] another resembling a snake denotes “father,” [xvi] the seated person represents “majesty,” [xvii] and together they highlight the potential that there is something scientific and esoteric afoot. Does this combination of known and unidentified glyphs give testimony to the emergence of a new improved species of hominid, contrived under the guidance and science of visitors from afar? The symbol for endure (Figure 16 below) is made up of two legs, two circles with an ellipse on top. But on the wall the ellipse is in the middle, positioned where the figures waist would be. With all the implied genetic manipulation above, could this figure actually depict the bearing by women (of either alien or Original stock) of the genetically engineered species? The figure certainly appears very pregnant, rather than a depiction of ‘endurance’. Then to finalize this genetic equation is a glyph which is not even remotely similar to any standard text. Just to the right of this ‘pregnant’ woman is a complex set of shapes and lines that could, especially when placed into context with what surrounds it, signify some sort of laboratory. In what was a huge surprise, a rather non-descript hieroglyph we assumed to be Proto-Egyptian representing “dj,” (thus forming part of the name of son of the Egyptian King, Lord Djes-eb) may also have the same genetic undertones. My colleague Sonya James forwarded on photographs of the glyphs to Yousef and Patricia Awyan, Co-Directors of The Khemit School of Ancient Mysticism in Egypt. It was Patricia’s response that led us to question whether the small section we accepted to be Proto-Egyptian was actually the younger form of script. While such a proposition may appear to be beyond the realms of fantasy, there is more to this genetic template than a few scratchings on two walls near Kariong. At Egypt’s Temple of Luxor, carved into the outside wall of the ‘Holy of Holies’, is a series of engravings that graphically illustrate the very first step taken toward the creation of a new genetically improved hominid. My colleagues and I believe this is a record of the collection of sperm from ‘Sky-Heroes’ with the assistance of a quite unusual device - consisting of a cup and some sort of staff/sceptre. In what only adds to the possibility of the depiction of such procedures, there are two cups attached to this elaborate shaft. One receptacle is obviously used to collect sperm. Could it be the other was used to store the human egg? Wall of the "Holy of Holies"
Before passing any judgment on the carvings on Kariong walls, my colleagues and I believe the site must be viewed in context. Original Elders and custodians of lore and history from all over the Australian continent have made it clear that Pleiades forms a central part of their ancestry, and spoke of older Original writings which could be interpreted (as we have) to be of Pleiadean inspiration. 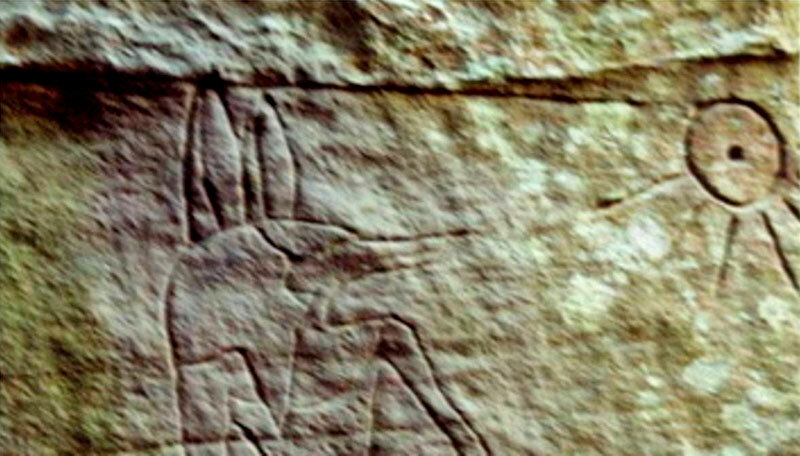 We have learned of many sites in various locations that affirm there was an ancient Egyptian presence in Australia. And although ‘white’ experts dismiss such notions as ridiculous, plainly, someone is wrong. [i] Dr. Hans Dieter von Senff, Egyptians in Australia: The Translation of newly found Egyptian Hieroglyphs at Kariong in N.S.W. Sumpibus Publications, 2011. [iii] Johnson, Raymund and Runbel, Edith May, Basic Hieroglyphica, (1997), 63. [xii] Dieter von Senff, Dr Hans, Egyptians in Australia: The Translation of newly found Egyptian Hieroglyphics at Kariong in N.S.W., (Sumptibus Publications, 2011). [xiv] Johnson, Raymund and Runbel, Edith May, Basic Hieroglyphica, (1997), 91. [xix] Spiers, Beve (Aunty), Egyptians in Australia Part 2, 2012. Earlier this month, I led a group of colleagues to the hieroglyph site at Kariong NSW (including the founders of WuW). I knew roughly how many people I had invited and what each person could contribute to the day’s expedition. But even so, it was a big group - and a final count made it obvious the logistics of fitting the entire group in and around the two ‘glyph walls was going to be challenge. We filmed known sites, and continued searching for astronomical markers… and whatever else was engraved onto the myriad of rock platforms in the area. The section of hieroglyphs we estimate to be 92% Proto-Egyptian script was already examined in our previous work, so my main focus for this trip was the remaining panels of ‘glyphs; in particular, the opening section which depicts what my colleagues and I suspect to be the creation of modern humans through genetic manipulation. I noted previously that only 44% of text in this section is Proto-Egyptian, while the remaining text is made up of unfamiliar symbols. Darkinjung Elder ‘Aunty’ Beve is also adamant there are two forms of text on those rocks; the newer Egyptian hieroglyphs and the much older Original script. With an ancient Egyptian/Australian involvement now a given, it is highly likely the ancient Egyptians learnt the art of written communication from their Original tutors, and the engravings between the two walls are a combination of both cultures and scripts. What is still open to debate is… what inspired the genesis of the far more ancient Original Australian script? It is my belief that beings from a distant constellation were directly involved in the creation of the Original people. Our legends tell us we come to this planet on a space ship made of energy. When it hit this atmosphere it turned to crystal. beings descended from the vessel. There are also legends of a messiah-like ‘oracle’ (also depicted in the Kariong glyphs) cloaked in a diamond, guiding and teaching many tribes. My very first introduction to the possibility of a Pleiadean involvement came through a meeting with a prophet by the name of Valerie Barrow, who was first introduced to this site and its ancient heritage by Bundjalung Elder, Jerry Bostock. From the time Jerry was very young, his grandmother had taught him that the Original people’s ancestors came from Pleiades. And throughout Australia, that same celestial theme continues to dominate. Dreaming stories of the Seven Sisters (Pleiades) seem to transcend tribal affiliations and geographic boundaries. So far, my colleagues and I have yet to meet a tribe that doesn’t re-count the activities and journeys of those Seven Sisters. But enough about Pleiades; whether I am right or wrong is inconsequential. 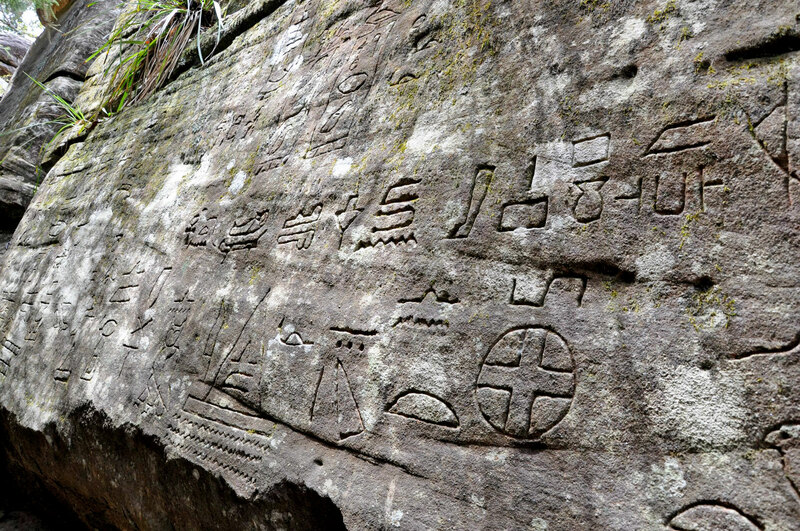 Kariong provides examples of an ancient form of Original writing, and rock solid evidence of an ancient Egyptian presence in Australia. And our latest trip through the Kariong site revealed several new observations of importance. First and foremost, we completed an examination of a small passage of ‘glyphs that appear to conclude the segment describing the creation of Homo Sapien (Sapien/Pleiadean) - which I discussed in my previous article. Found to the far right of the “genetic” narrative, and slightly apart from the next section, the cluster of eight ‘glyphs (Figure #1) describes who was responsible - and perhaps even their motivation - for genetically modifying one strand of hominid. The largest and focal glyph is not Proto-Egyptian, and is repeated in a section of three UFOs flanking the same seated figure. Both show a seated figure with a control-stick or device seemingly protruding from its stomach. We believe this person was steering an extra-terrestrial mother-ship, and was of the highest rank. The flag nearby, which denotes “God”, only confirms the majesty of the being or person depicted. And the ‘Dalek-like’ icon represents “oracle/sanctuary”, which strengthens the sense of status and benevolence attributed to this being. Beside the celestial navigator’s feet is a hieroglyph that skeptics and officials have embraced as part of popular “hoax” theory; the ‘dog-bone’ cased in a rectangle twice over. Although doubters deny the rectangle and bone any legitimacy in Proto-Egyptian script, Raymond Johnson’s Proto-Egyptian dictionary “Basic Hieroglyphica” (page 38, hieroglyph 1172) depicts the exact same rectangle and bone ‘glyph. Meaning “heir, lot”, this ‘glyph represents ‘a heritage passed on’ - of either an esoteric and genetic persuasion. Together, this passage of script provides an ancestry, a connection to distant stars … and something even more fascinating. This “sanctuary” was chosen. There was no accident or afterthought. The genetic manipulation was entirely by design; part of a greater plan. As to what that plan was, and still is … all we can do is read on. Some may say this all comes down to interpretation. But there is more to this site than two hieroglyph walls. Much more!… a fact that has been overlooked by the skeptics and hoax theorists. There are two shafts that run into and under the northern wall; one I recently discovered, and one is claimed to have been first found in the early 90’s. The ‘NSW Parks & Wildlife Service’ responded with its customary insensitivity by filling up the opening to the shaft with several tonnes of rock. With the shaft filled, a lost mystery was hidden. But not for long! It was more like a mining site than a dig. Gavin Bragg, an invaluable member of our group - and a man who climbs into places I refuse to venture - went it. Extending from the shaft are three small tunnels. One is around 10 meters in length, but is very narrow and covered with debris and sand (see below). Then there is the main gallery, which Gavin describes as “big enough to park two cars”. One of the other tunnels runs on a different trajectory - sloping downwards. But we are unsure of what it might reveal, as the smell of methane was too overpowering for Gavin to venture any further in. Surely the time required to excavate a shaft, three tunnels and a gallery - and remove the material completely - exceeds the capacity and conviction of any supposed hoaxer! these tunnels are not the result of “unusual” geology, they are the result of specific human endeavor. An element of “devil’s advocacy” is essential when evaluating a site like Kariong. Critics - including the skeptic in our team - generally attribute unique formations on this site to “bizarre” and “unusual” geology. But is it reasonable to view each “bizarre” formation individually, without taking the others into consideration? Is this area teeming with geology of the rarest varieties, or is there something more significant being communicated here? How can we see close to ten extremely unusual geological formations, all clustered around the hieroglyph walls, and not consider the site in context? We agreed to disagree - for now. But the next site we found was met with awed silence. We located a second set of hieroglyphs. It was clear even to the skeptics in our team; Egyptians were here in ancient times. Standing in front of these glyphs, positioned a considerable distance from the two main ‘glyph walls, there could be no more denial of it. Until now, no-one even knew of these engravings, no-one has claimed responsibility and no-one has alleged that they are fake. This newly discovered site revealed two panels of hieroglyphs (see above). Immediately, three things stood out; they were smaller than the other ‘glyphs, very worn, and found in a protected location. The wall above was vertical but sloped outwards slightly thus ensuring the water run-off was not a factor, while the ledge in front shielded the site from direct sunlight and most winds. The style and script is reminiscent of the older panels on the walls, and is comprised of a matching ration of Proto-Egyptian and non-Egyptian script. 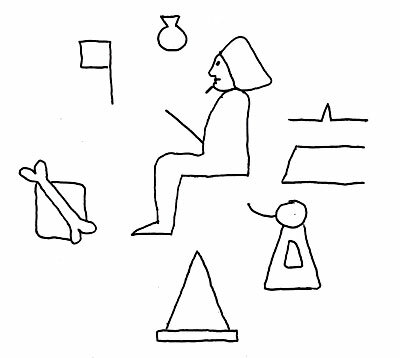 Of the 9 distinct symbols depicted, four (or 44%) are a direct match for glyphs already documented in Ray Johnson’s Proto-Egyptian dictionary, “Basic Hieroglyphica”. This coincidence was not lost on me: the opening section of 81 glyphs - of which 36 were an identical match - also includes 44% Proto-Egyptian script. This may be due to pure chance, but standing at this new site, I was aware that the mathematics was consistent at both sites. I set about deciphering the Proto-Egyptian script. The second refers to “beginnings”. It could relate to many beginnings, but “germination, the beginning of a new life” is a more specific interpretation - and is congruous with the other scripts which depict the first arrival of Egyptians in distant times. 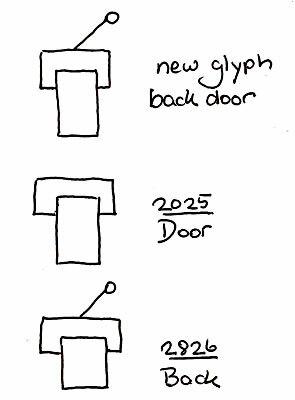 The third glyph was smaller but identical to an engraving found on both walls, “coffin”. Its inclusion here replicates references to Nefer-Ti-Ru’s demise and internment. Read in combination, we have; a distance, a statement about the beginning of something, a reference to a coffin, then the nomination of where it was deposited - apparently somewhere inside the same back-shaft that revealed its dimensions and complexity to us barely an hour earlier. Was this an Original testimonial bearing witness to the appearance and acceptance of ancient Egyptians through some form of concord? It appears so. Unless this is all a hoax… a brilliantly executed concoction that remains without equal in this country’s history. The more carvings the Kariong site reveals, the less the hoax theories add up. The planning and effort required to excavate and remove tonnes of rock from the site already makes a “hoax” theory improbable. The complexity and accuracy of the hieroglyphs leave no doubt that the many of the carvings are genuinely Proto-Egyptian. Other hieroglyphs have also been found in the area, which have never been claimed as part of a “hoax” theory. 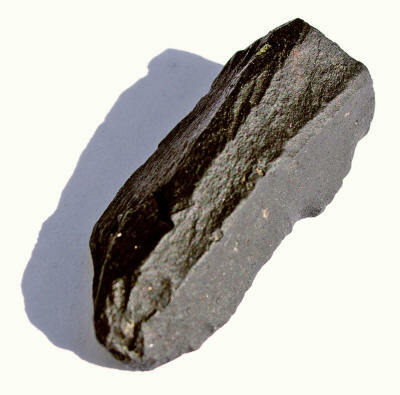 A basalt chisel (see right) found on the site by Dr. Hans Dieter von Senff and Dan Collins was subsequently determined by a gemologist to have “most likely originated in Egypt”. Artifacts found in the area by Elder ‘Aunty’ Minnie Mace (of the Koa people) include human bone and a piece of jewellery depicting a person kneeling, arms outstretched. Then there are all the Egyptian motifs and Gods engraved into the rock platforms nearby…. Considering the knowledge, complexity and labour required to manufacture a hoax of this scale, there can only be one reasonable conclusion. This site is genuine; a message echoed by the Original people of the area. Original keepers of lore and history have often spoken of ancient Egyptians (and others) visiting Australia. Across the country, the story never varies: they came in search of esoteric wisdom, supernatural powers and insights. The one variation to the story is that the last Egyptian visitors showed little appreciation for the wisdom they were offered and refused to leave - and were subsequently ejected. But the “official” response of the ‘NSW Parks & Wildlife Service’ simply defies common-sense. The NPWS marks important sites as “hazardous”. It fills in newly discovered tunnels and caves with solid rock. It ignores new evidence of historical importance. Most importantly… it has never bothered to consult the Original custodians of the area. Understanding the site’s significance, the Original people spoke out anyway. Respected Elders King Bungaree, ‘Aunty’ Beve Spiers and David Fitzgerald have all provided testimony of an ancient Egyptian presence in the area. But the NPWS simply did not listen. Rather it continues to treat the site - and its custodians - with disrespect. And it is that disrespect which, irrespective of geography or lore, is absolutely central to our disagreement. At Kariong NSW there is absolute proof that ancient Egyptians were in Australia. But this story isn’t unique to Kariong. 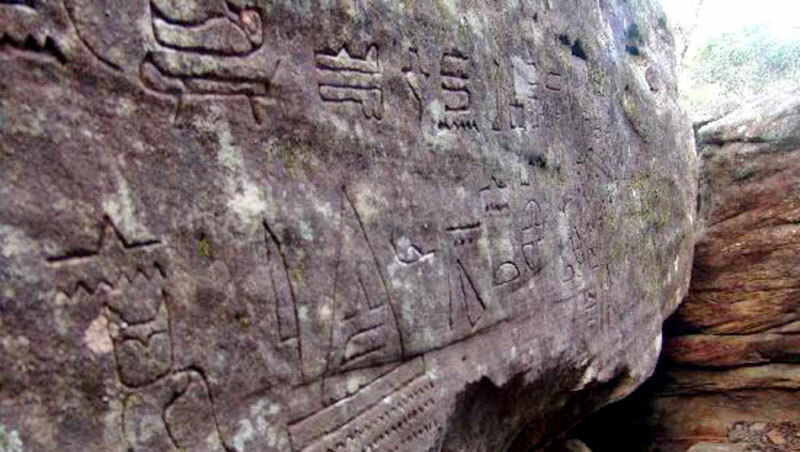 At another site at Cedar Point NSW (near Kyogle) there is unchallenged evidence of the Egyptians’ motivations. While the Kariong site is under threat of property development, Cedar Point has been designated to become a massive quarry for the extraction of millions of tonnes of basalt. Despite consensus between miners, land owners and the Original custodians that this is a legitimate Original sacred place, it will soon become a massive hole in the ground. According to ‘White-fella’ authorities, legal processes were observed and regulations met. But those trying to protect the site are adamant; lies and deception dogged their every move. An earlier application in 1999 for a license to extract over 5 million cubic tonnes of basalt had been granted, contingent upon four conditions set out by NPWS. All provisos specified that the relevant Original parties must be in agreement, the fourth specifically stated that the developers must obtain “a letter” where an “agreement” to “development” was given. The relevant Original parties must be in agreement. The secret sacred men’s ceremonial site - where initiation, shield and tree carving was conducted - was apparently safe. But in early 2012, another mining application was made to NPWS. An official assessment and consultation with relevant Original parties was conducted, and once again, Original custodians, spokespersons and the developer all agreed that this was a men’s ceremonial site. But the paperwork was ‘flawed’; the site had never been officially gazetted on the appropriate White-fella register. Legally, it had no standing as a sacred site. Without the “correct” paperwork, it is just a pile of dirt and rocks. But rather than correct the paper-work and acknowledge the site’s importance, NPWS prefers to exploit the loop-hole... and continues to treat the site like a pile of rocks. Like the Kyogle High School is here for our young to learn, this (site) was here for us to learn our laws, our blood ties, our ceremonies and to know fully the laws you have to walk in to be in this tribal system. The Githubal people will do their best to protect this special location. And maybe, just maybe, they can save it. But call me cynical… some things never seem to change in Australia. When it comes to what rightly belongs to the Original people of this land - be it their history, lore or sacred places - those in “power” refuse to listen. The paperwork was just flawed. It is time this information came to light. Promisingly, media outlets (including ABC Radio) are preparing to re-open coverage of the discussion about an ancient Egyptians involvement in Australia. To support the dialogue in the community, my colleagues and I have just published a new piece on YouTube entitled “Egyptians in Australia, Part 4” which further examines evidence from the Kariong site. At Cedar Point, the local media are also providing coverage. On December 2nd supporters of the Githubal, both Original and non-Original, will fight to save their heritage by gathering in homage nearby. It will not be a boisterous protest but a day of reverence, respect and quiet reflection; of song, dance and ceremony; an opportunity to connect with the guardian Spirits of that sacred site. Most importantly it will be the time to assure the Spirits that the land will not be lost but reclaimed, and the day will come when the Githubal men will again dance and sing at that special site. As it was before so shall it be again. That will be our collective mantra. Although their origins are separated by thousands of years and 600 kilometers, the same politics, ignorance and cultural insensitivity blights both these sacred locations. But the site at Cedar Point will be protected. The site at Kariong will be accorded its rightful ancestry. Yesterday’s mistakes will become tomorrow’s salvation.